Mini Trampolines – Are There Any Differences Between Them? May 1, 2018/Sebo.Marketing/Comments Off on Mini Trampolines – Are There Any Differences Between Them? Not all trampolines are created equal. Most are intended for recreational use and don’t offer quite the same benefits as those designed for fitness. Designs and styles are different, which can leave a consumer not knowing which is best for them. The trampolines do have one thing in common:they are a lot of fun and are fabulous for fitness. Most people have not considered how trampolines were invented or became popular. Surprisingly, trampoline-like products have been found in ancient civilizations of Iran, China, and Egypt. Experts excavating the sites aren’t sure of the purpose of the devices, but believe itmay have been religious ceremonies or celebrations. The modern trampoline got its start from the Inuit population in Alaska. These creations were made of walrus skin, and people would launch each other into the air to scout for animals at a safe distance. Of course, the trampolines were also used for fun. George Nissen and Larry Griswold are responsible for the invention of modern trampolines in 1936. Both men had backgrounds in gymnastics at the University of Iowa. The pair had seen thenets used by trapeze artists and believed they could add value to gymnastic routines. The early designs included a stretched piece of canvas, held in place by grommets and springs. Nissen and Griswold employed the devices for personal use until 1942, when they began marketing the items to the public. The pair agreed to name the device “trampoline,” based on the Spanish word for diving board, trampolin. During World War II, the Navy Flight School used the trampoline to train for spatial orientation. The practice was disorienting, which helped train the pilots for similar circumstances experienced while flying. When the US space program began in the early 1960s, astronauts would use trampolines for weightlessness training. The launching effect of trampolines is like the feeling experienced in space. During this time, the trampoline was gaining popularity among everyday citizens. The evolution of trampolines has resulted in the creation of many different varieties. All trampolines are similar in nature but have a few major differences. Some are for recreational purposes, while others are used specifically for fitness. These are the popular variety of trampolines seen in backyards across the country. The trampolines are between 12 and 16 feet in diameter and are typically surrounded by a safety net. These devices are for children’s recreational use. This trampoline type is growing in popularity for two reasons. The first is the ability to better fit large rectangular items in a backyard. The shape fits more precisely with fencing and home space. Second, rectangular trampolines provide a higher bounce due to uneven distribution of force. Rectangular trampolines are for gymnasts and should be considered only for skilled jumpers. Water based trampolines are inflatable and placed in wide open water spaces. The devices are for bouncing or for launching users into surrounding water. Water trampolines are popular at lakeside resorts and summer camps. 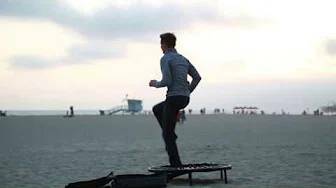 Small trampolines are for fitness. These devices are for indoor use and are easy to store. Users enjoy them for the health benefits and low-impact. Trampolines come with spring or bungee designs. Traditional trampoline designs include springs for bounce. Only in recent years have designers begun releasing bungee trampolines. The two types are as different as they look. If you are in the market for a mini trampoline, you’ll want to choose the spring variety. There are a few reasons for this. Springs last a lifetime, never wearing down or falling apart. Bungee springs are known for having a short lifespan and can restrict movement after a few uses. Springs are coated for rust-free jumping. Trampolines with springs provide a better bounce for users. The springs never wear out, meaning you will jump as well today as you will in ten years with the same product. Bungees provide little bounce and are sluggish. Bungee trampolines require special rubber bands based on the user’s weight. If your wife weighs 50 pounds less than you, separate trampolines are necessary. Spring trampolines provide a fitness option for everyone, regardless of weight. Spring trampolines typically don’t squeak. If after 15 years of use a squeak presents itself, owners can add a little oil for a fix. The bad part about bungee trampolines is their constant squeakiness. From a young age, bungees will squeak and there’s nothing to be done about it. Trampolines with springs are much more affordable than bungee trampolines. Some spring varieties are half the price of their bungee counterparts. There are many health benefits to trampoline jumping, which is why the practice has been popular for so long. Not only is the practice fun, it’s great for your health. People of all ages and fitness abilities can use trampolines for an effective exercise routine. The biggest benefit to mini trampolines and rebounders is entertainment value. Unlike other methods of boring, redundant exercises, trampolines provide a good deal of fun. Many people tell us the use of trampolines reminds them of childhood. One unknown benefit to jumping on trampolines is their ability to increase lymphatic flow. The movement creates pressure changes in the body, which works as a vacuum to suction out toxins and bacteria in the body. The activity results in the increase of white blood cells, which helps fight illness. Most cardio exercises are high-impact and difficult on the body. Trampolines are soft, unlike roadways or trails used for running. Running often leads to foot or leg problems from constant jarring. Jogging or jumping on trampolines is cardio, but always low-impact. Any aerobic activity can burn calories, including jumping on a trampoline. The difference is the amount of fun you’ll have while you’re doing it. Burning calories can lead to the reduction of body fat. A study from NASA has shown an individual spending one hour on a rebounder will burn more calories than an hour of jogging. As we age, we begin to lose muscle and bone mass. This leads to many issues throughout the body, including osteoporosis. Jumping on a trampoline or rebounder increases the G-force on a body, which will strengthen muscles and increase bone mass. Regular exercise on a trampoline can drastically reduce the chance of developing osteoporosis. The stress hormone cortisol can have adverse effects on your body. Regular exercise will release relieve stress and tension. This can reduce cortisol levels while improving circulation. Reduced stress levels can help you lead a better life and improve sleep habits. Another overlooked benefit of jumping on trampolines is the improvement in vision and prevention of worsening vision. Inactivity is a big cause of poor vision, resulting from limited blood flow to the eyes. Exercising on a trampoline will increase blood circulation to the eyes and improve vision. What Type of Trampoline Should I Choose? Deciding on a trampoline type will depend on your intentions for use. The popular round design trampoline should be left to children. Kids are more flexible and less likely to suffer from injury on large trampolines. Adults aren’t as agile as children and can seriously injure themselves on this size trampoline. Mini trampolines or rebounders are great options if you’re looking for a trampoline for fitness. These will provide the resistance needed for a good workout but are safer than the larger alternative. Mini trampolines and rebounders are similar but do have differences. Rebounders are a bit smaller than mini trampolines. Rebounders are also portable, unlike mini trampolines. Once mini trampolines are set up, they usually stay in one place. Another key difference is that rebounders are designed for fitness. High-quality rebounders have user-friendly designs to help prevent injury. Trampolines will typically have low-quality mats with less support. The high-quality mats found on rebounders allow for more controlled and concentrated jumping.